We asked the fans of our hockey page on Facebook what skating skill they needed the most help with and most of them asked for help with the backwards crossovers. The backwards crossover can be a tricky skill to learn, especially when someone tries to explain it to you, or even show you everything all at once. There is a lot going on so in the video below we show you everything step-by-step so you can better understand what you should be doing. First learn the basics – Before you start attempting to crossover while skating backwards you first need to learn a few of the “building blocks”. The two skills that you should be comfortable with are crossovers while standing still, and backwards c-cuts. If you can’t do these keep on working on them, once you feel comfortable with both of the above skills then you can try the more advanced backwards crossover. To practice crossovers just stand still and practice moving laterally and putting one foot over the other. This will help you feel comfortable shifting your weight from your inside edge to your outside edge, and getting one leg underneath your body while the other crosses over. You need to be comfortable on your edges and shifting your weight so work on this a lot remember to bend your knees while practicing! After you know the basics try using both – Now that you are comfortable crossing over while standing still and doing backwards c-cuts you can try both at the same time. Take a few backwards strides and glide for a few seconds to get your balance, now try crossing over just like you did when you were standing still. Remember to bend your knees and don’t lean too far forwards or backwards. After getting comfortable crossing over backwards practice using the same motion to get a bit of speed. Instead of just crossing over, try pushing off while crossing over to gain speed. Now try going around the circles – If you are comfortable with the backwards crossovers you can try doing them over and over while going around a circle. Get on any of the circles and follow the steps below All steps below are shown in the video above. Now work on getting your legs working together. While practicing work on extending your reach as much as you can, this way you will be very comfortable on your edges. You should also try to get a push from both legs to gain more speed. Remember to keep your balance centered, don’t lean too far forwards or backwards. Remember to also practice the quick crossovers (shown in the video). You will use these the most while transitioning from forwards to backwards and backwards to forwards. Defensemen will use these a lot when they are trying to pace a forward who has the puck. When the forward moves across the ice trying to beat the defencemen a few good crossovers will keep the skating speed up and also help close the gap a bit. 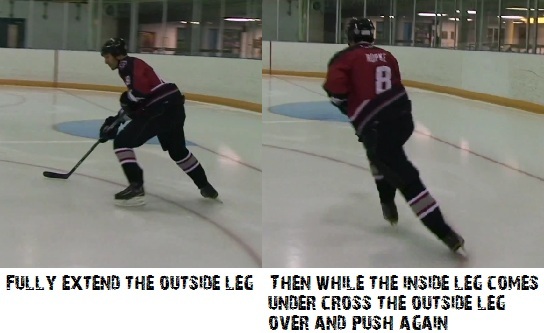 Good lateral movement is vital for defensemen. 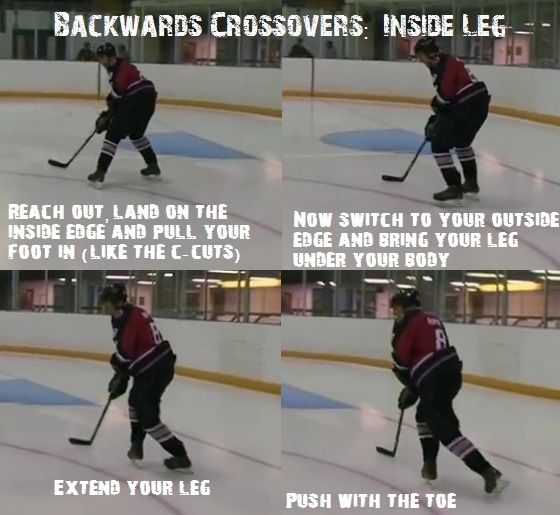 Forwards will use these quite a bit when transitioning from forwards to backwards or backwards to forwards. Using a few quick backwards crossovers will help you pick up (or maintain) speed while changing directions. I hope these tips will help you improve your skating. You can share this article with the buttons below, and you can also join us on Twitter, Facebook and Youtube! Instead of just 4 frames and vague descriptions, try 10 frames for each leg. It simply isn’t clear what’s happening (I say this after viewing every – I’m not joking – youtube video I can find). Even in slow motion one can’t tell WHEN the push occurs and off which foot at which point in time. I can crossover both ways, forwards and backwards, but I really don’t get the kind of bite I need or want with my outside edge/inside foot. Other than outside edgework, are there any other drills or skills I can do on or off ice to build that trust in that particular edge? I use backwards crossovers to build speed while moving backwards, too. If a forward is trying to get by you be speeding up, a few backwards crossovers can speed you up with him.